Bring milk to a boil in a large saucepan. Bring to a boil and cook 5 minutes, washing down any sugar crystals that may have formed on the sides of the pan with a pastry brush dipped in warm water. 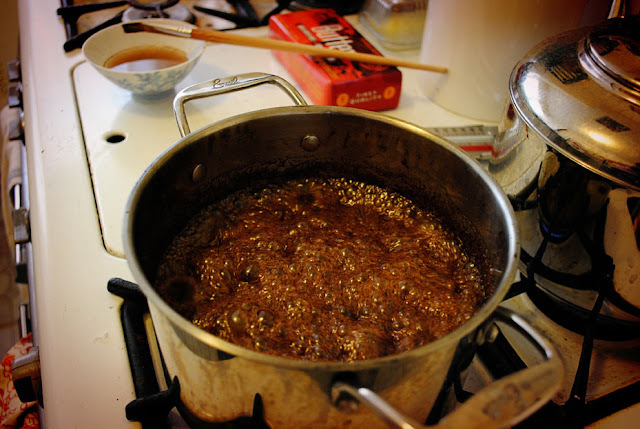 Reduce the heat, place a warmed candy thermometer in the pan, and cook, without stirring, to 234 F, the soft-ball stage. When nearing 234 F, there will be a fine overall bubbling with, simultaneously, a coarser pattern, as thought the fine bubbled areas were being pulled down for quilting into the coarser ones. Remove from the heat without jostling or stirring. 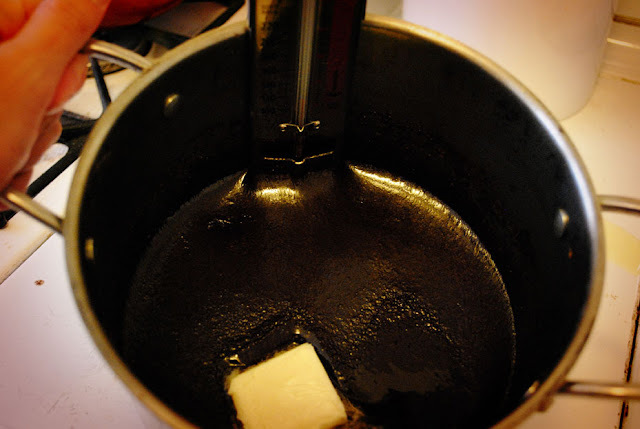 Cool the fudge to 110 F. You may hasten the process by placing the pan in a large pan of cold water until the bottom of the pan has cooled. Beat until it thickens and begins to lose its sheen. At this point, the drip from the spoon, when you flip it over, holds its shape against the bottom of the spoon. Quickly stir in nuts. 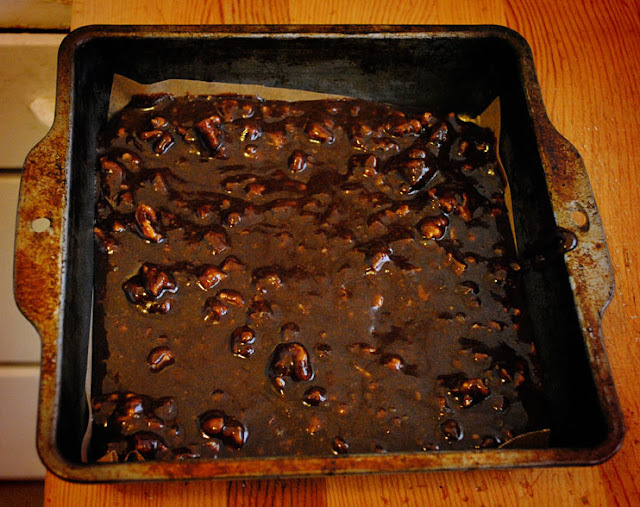 Pour the fudge into a buttered 8-inch square pan (I lined with parchment). Cut into pieces before it hardens (I forgot to do this and shouldn't have, it just crumbled and broke when trying to cut it). 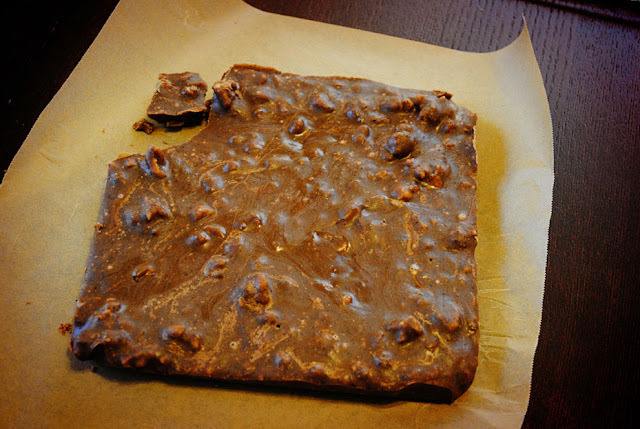 This isn't the super creamy fudge that you get at most places, but it's also not as dry and dark as the fudge that comes from the recipe off the back of the Hershey's cocoa tin. It doesn't use corn syrup, because I try to avoid that ingredient, so that may explain the lack of super creaminess. It was very good though, and every last bit was devoured.